Magpie Quilts: Guild Tinners Exchange Done! I have always been one to enjoy a challenge. I've participated in a few online quilt block swaps and mini quilt swaps. But it's always fun to do a challenge with people you see in person on a regular basis. The Dalemead Quilt Guild that I belong to has been exchanging tins in what is called the "Tinner Exchange". Everyone who wanted to participate brought a tin and $10 to the first meeting. At the next meeting, they were given a tin that contained some fabric and either a pattern or a theme. Because we had quite a few members signed up, we were split into 2 groups and all our exchanges were within that group. Each month we were to make a block with the fabric in the tin we had and bring it back to the following meeting to pass the tin on to the next person in the group and to collect the tin we were to work on next. Because we have many quilt guild members who are snow birds or had extensive travel plans, we weren't very good at keeping to a once a month schedule. Sometimes tins were exchanged early, sometimes 3 or more tins were received at the same time. I think we drove the organizers of the exchange batty by not following the schedule! When all the tins were finally finished (one block for each member of the group in the tin), we drew names for each tin. Because there were only 11 people in our group, I needed an extra block to bring some balance to the quilt layout. 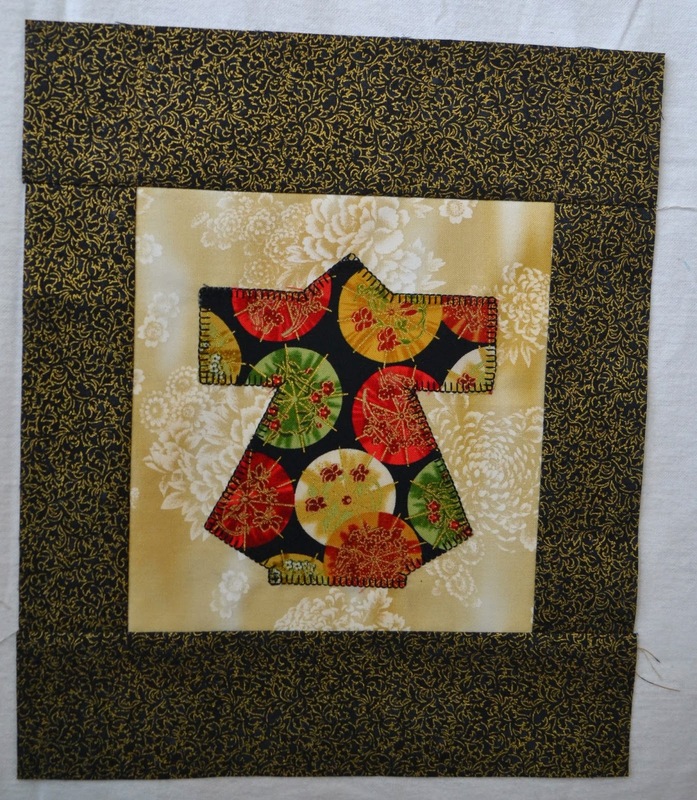 I had this kimono block kit from Diane McGregor from Castilleja Cotton that was a gift from Quilt Canada 2010 in Calgary. And I love this block - it was amazing to see all the different techniques and blocks that were made with just one fabric (the one on the lower left in the picture above) and a theme (Japanese). Here's my tentative layout. I just need to find some fabric for sashing and a fabric to use to bring the blocks up to the same size. Have you done any challenges lately? Do you love them or not so much? Great blocks! I really like this idea. Have fun finishing this quilt! 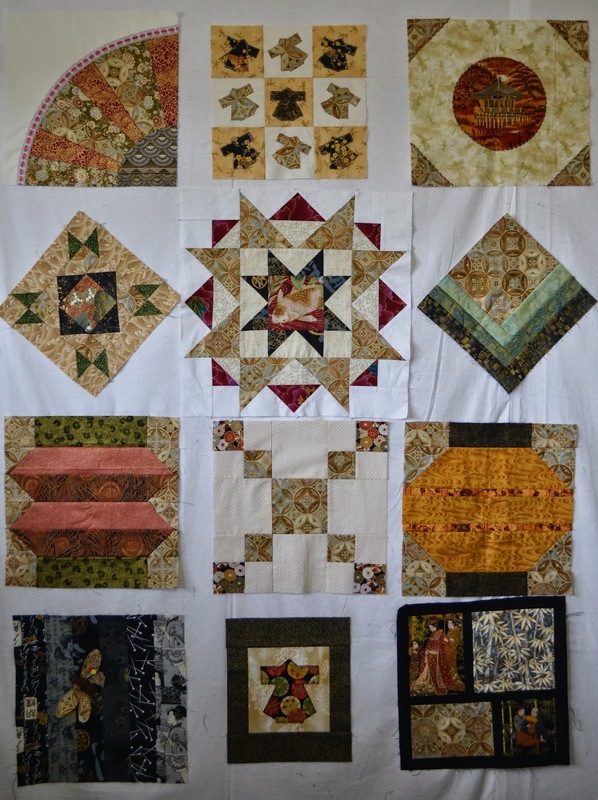 What beautiful blocks ... you will have a gorgeous quilt with lots of memories pieced into it! Beautiful blocks! It is going to be a wonderful quilt! Just gorgeous! The finished quilt will be mighty special. Sounds like a fun challenge! Looks like you ended up with a great tin of blocks. I just finished a guild challenge entitled "Silk purse from a sow's ear". The 8 charm squares given to us were less than lovely (to put it mildly). 27 projects of the 60 packs distributed were displayed Tuesday night and it's amazing what members did to improve the look of those fabrics! I decided to get quite literal and make a crazy-quilt purse using some of my silks to add to the less-than-lovely fabric. Wow, Ann. You received a lovely set of blocks. It will be great to see all the finished tops. I was disappointed to miss the meeting when everyone received the final full tin of blocks.